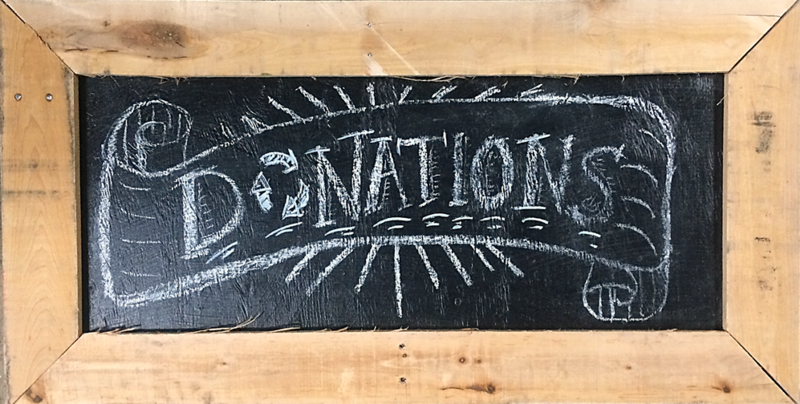 Home » Blog » Changemaker Challenge: Go zero waste and turn plastic scraps into eco bricks! Changemaker Challenge: Go zero waste and turn plastic scraps into eco bricks! Plastic pollution is a huge problem that all humans and animals are facing. Future generations will never know the beautiful world that we grew up with, because they’ll be stuck cleaning up what we’ve left behind. The best way to tackle the ever growing problem of plastic pollution is to go ZERO WASTE! First and foremost, this means that we must stop consuming plastic as much as possible. Our daily use of plastic bottles, take out containers, cups, straws, lids, forks, spoons, plates, cellophane, and excess packaging is a direct, daily source of environmental harm. We are all on this planet together, and we all have to start doing our part to slow down and stop plastic consumption in our daily lives. One fantastic and creative way to reduce our production of plastic waste and begin our zero waste habits is to make bottle bricks! Bottle bricks (or eco bricks) are plastic bottles stuffed to the brim with man-made, non-biodegradable materials. 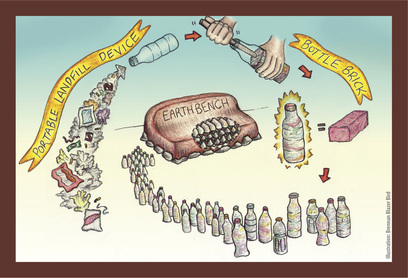 An infographic from Peach on Earthbench Movement (POEM) demonstrates how bottle bricks capture plastic waste and turn it into a building material. Rumor has it that this idea originated in a small town in Central America, as the local solution to a widespread problem. Corporations like Coca-Cola and Lays would import their products into small towns without municipal waste collection and recycling facilities, so the trash would wind up in a pile in the middle of town, blowing around in the wind, getting caught in the waterways, and affecting the local wildlife. Sick of the sight of the plastic, and its impact on their local environment, some innovative people decided to clean the plastic and stuff it into bottles. They used the resulting “bottle bricks” as a building material – an alternative to the energy intensive, and sometimes expensive, regular bricks. This idea has taken off! All around the world, people are cleaning up their neighborhoods and making these Portable Landfill Devices. 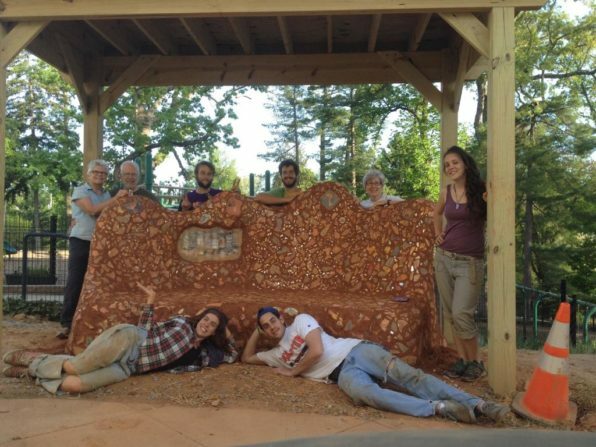 Through the Peace on Earthbench Movement (POEM), folks build benches made from bottle bricks all around the world. Another organization, Hug It Forward, is using bottle bricks to build schools in remote countryside villages. Bottle bricks are a plastic pollution solution! Our very own Reuse Associate, Jane, has built four bottle brick benches with Pick Up America and The Harvest Collective. 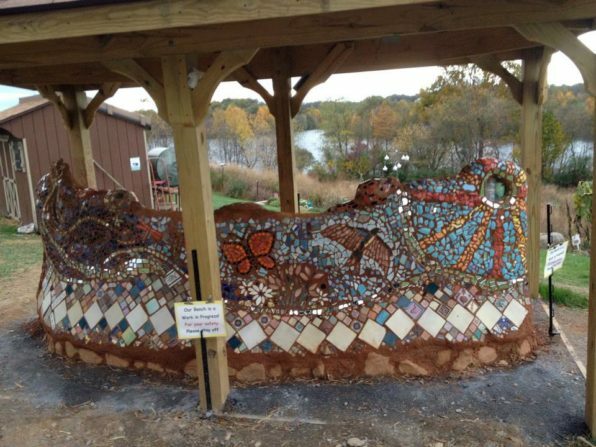 Now, she’s teaming up with our Community Building Blocks grant recipient and Changemaker Challenge winner, Erin, to teach an informative workshop and build a bottle brick bench for Erin’s Safe And Beautiful Bus Stops project in Elkridge, Maryland! 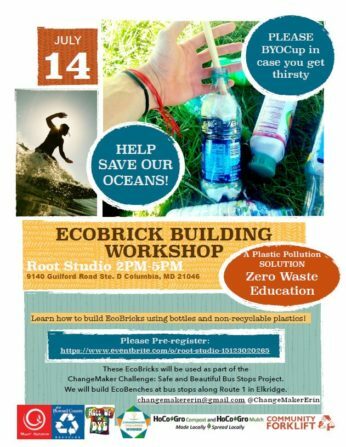 The Zero Waste Eco Brick workshop will take place on Saturday, July 14th from 2pm – 5pm at Root Studio – 9140 Guilford Road, Suite D, Columbia, Maryland 21046. Free registration is available through Eventbrite. Attendees will be building bottle bricks and learning about the zero waste lifestyle. All ages are welcome to attend, but children under the age of 12 must be accompanied by an adult. Interested in the workshop? Start collecting your plastics! It takes a LOT of plastic to make one Bottle Brick, so workshop attendees are welcome to start collecting non-recyclable plastics now. 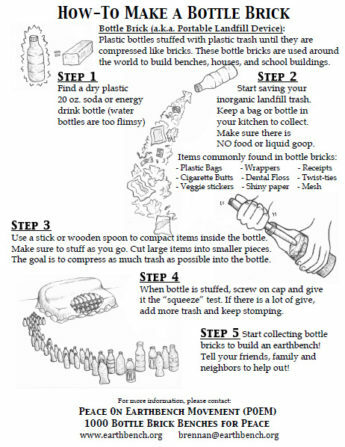 If you want to make your own bottle brick to be placed in the Bottle Brick Bench, please refer to the “how to” image, and please avoid using any plastic materials that have food residue. Feel free to bring your bottle bricks to the workshop, or drop them off at the Forklift sales desk for Jane. If you have any questions about this project, or bottle bricking in general, feel free to come into the store and ask Jane at the sales desk. She’s here Monday through Friday. Remember friends, we do not inherit the earth from our ancestors, we borrow it from our children.